GOP lawmakers speaking on alleged ballot fraud Thursday. As revelations of apparent ballot fraud continue in the state’s Ninth Congressional District race and calls for a new election grow louder, GOP lawmakers and Democratic party officials traded barbs over who should be investigating the matter and how. “Any fraud is unacceptable in the state,” said Sen. Tommy Tucker, a Union County Republican who represents the Ninth District, which has seen five ballot fraud investigations since 2010. The state board of elections has shown its “ineptness and inability to be able to transparently and without partisanship…resolve these issues,” Tucker said, whether the problems presented themselves under Democrats like current Gov. Roy Cooper and former Gov. Bev Perdue or a former Gov. Pat McCrory, a Republican. Tucker was joined by Sen. Dan Bishop and Sen. Paul Newton, who also represent the district, to call on Cooper to convene a bi-partisan task force to work separate from the Board of Elections investigation. Tucker, who is finishing his final term in the General Assembly, volunteered to join such a group. In his own press conference Thursday, state Democratic Party Chairman Wayne Goodwin said Republican lawmakers need to stay out of the investigation and allow the Board of Elections to do its job. At issue: An apparent “ballot harvesting” scheme wherein people in the district were hired by political operative McRae Dowless Jr. to go door-to-door collecting absentee ballots from voters. 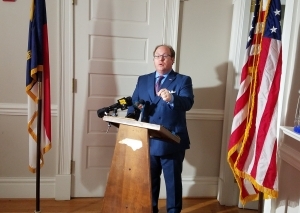 NC Democratic Party Chairman Wayne Goodwin speaking on ballot fraud Thursday. At least one voter alleges someone who picked up her ballot offered to finish filling it out for her. There are now questions about how many were harvested, whether they were all turned in and whether some were changed or intentionally made invalid. Mass collection of absentee ballots is illegal under state law. Dowless worked for the campaign of Mark Harris, the Republican candidate for Congress. He appears to have personally turned in 592 of the approximately 1,300 total absentee ballots requested in Bladen County. Only 684 absentee ballots were actually cast, leading to questions about absentee ballot requests made on behalf of people who voted in person or claim never to have requested an absentee ballot. While calling to avoid “partisan taint” of the investigation, Tucker and Bishop used the press conference to point to Democratic victories — including Cooper’s over McCrory — in which they said allegations of ballot tampering were insufficiently investigated. “The Democratic Party has a conflict of interests in leading this investigation,” said Newton. The only way to fully investigate elections in which both parties are suspect is to appoint a fully bi-partisan group to investigate, Newton said. The Senators said they didn’t want to supplant a Board of Elections investigation, but called into question the motivations of new Board of Elections Chairman Joshua Malcolm, a Democrat appointed by Cooper. State Republicans have criticized Malcolm as too partisan. The GOP lawmakers’ criticism of the board happens against the backdrop of a struggle over the board itself. A panel of three judges ruled the current nine-member composition of the board unconstitutional, but a court ruling last week is allowing the board to stay as it is through Dec. 12. Cooper and the legislature are in negotiations over the composition of the future board. Goodwin defended the Board of Elections’ decision to delay certification of the Ninth District results. GOP lawmakers and party officials initially criticized the board for the decision, but on Thursday Bishop said he would not certify the results under the current cloud of unresolved questions either. On Thursday Dallas Woodhouse, executive director of the North Carolina Republican Party, said he would be open to a new election if the results if evidence determined apparent fraud changed the outcome of the election – an about face from the party’s initial fierce insistence the board should certify the results as they stand. 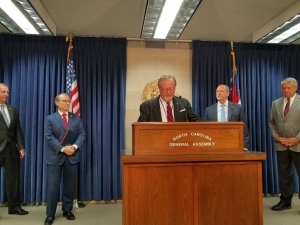 Goodwin said under-funding the board of elections, which has for years complained the General Assembly does not adequately provide adequate resources for elections investigations, is an important part of what is now happening. “That cannot be the excuse for not taking this issue on sufficiently to resolve it,” Bishop said.